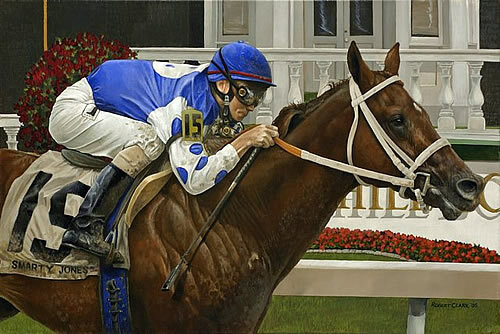 Smarty Jones is a thoroughbred race horse, and winner of the 2004 Kentucky Derby and Preakness Stakes. He is a third-generation descendant of Mr. Prospector, and as such Smarty Jones is related to many recent Triple Crown hopefuls including Funny Cide, Afleet Alex and Fusaichi Pegasus. Smarty Jones's own sire, Elusive Quality, holds the world record for a mile on turf. Also included in Smarty Jones' pedigree are Triple Crown winners Secretariat and Count Fleet, and such other Triple Crown race winners as Northern Dancer, Foolish Pleasure and the mighty Man o' War, who is considered #1 on the list of Blood-Horse magazine List of the Top 100 U.S. Racehorses of the 20th Century. His dam was I'll Get Along. Born at Someday Farm in Chester County, Pennsylvania, the horse was named after Milly "Smarty Jones" McNair, the mother of co-owner Pat Chapman. The two shared a birthday, and Mrs. Chapman wanted to honor her late mother. She said the horse was a strong-willed actor from birth and her mother too was a bit of a smart aleck as a child who had gotten the nickname "Smarty." Pat Chapman and her husband, Roy "Chappy" Chapman, had originally hired Bobby Camac to be Smarty Jones' trainer, but in December 2001, Camac and his wife were murdered by Camac's stepson, Wade Russell, who was eventually convicted and sentenced to 28 years in prison. This tragedy, combined with Roy Chapman's failing health, resulted in the Chapmans' decision to disband their small breeding operation, retaining only a few of their horses. One of these was Smarty Jones, the product of a breeding between their winningest horse, the mare I'll Get Along, and the stallion Elusive Quality. In 2003, the Chapmans gave Smarty Jones to John Servis for training. They sold the Someday Farm property and moved into a smaller home, training only four horses. On July 27, 2003, Servis was schooling Smarty at the starting gate, when the colt spooked, reared up, and smashed his head on the top of the gate. He fell to the ground unconscious, blood pouring from his nostrils. Servis thought the horse was dead, but Smarty regained consciousness and was treated by Dr. Dan Hanf, who stopped the hemorrhaging and treated him for shock. After the bleeding stopped, Smarty's head began to swell from the middle of his forehead over to his left eye. Dr. Hanf and assistant trainer Maureen Donnelly kept watch on the colt and kept him at the barn overnight. Hanf had seen the eye before the swelling and was confident the eye itself was not damaged, but knew the horse must have sustained a fracture due to the excessive swelling. The colt was sent the next day, July 28, 2003, to the New Jersey Equine Clinic for x-rays. There he was diagnosed with a fractured skull. The bones around his left eye were so badly damaged that the veterinarians thought they might have to remove the eye. Smarty Jones overcame his injuries after three weeks in the hospital, and spent more than a month recuperating on the farm. John Servis carefully led him back into training and by early November 2003, the colt had recovered completely and was ready to make his racing debut at nearby Philadelphia Park, a racetrack in Bensalem, Pennsylvania, a suburb of Philadelphia. Under Canadian-born jockey Stewart Elliott, Smarty Jones won the six furlong (1207 m) race by 7¾ lengths. Two weeks later, the horse ran away from the field to capture the Pennsylvania Nursery Stakes by 15 lengths. At that point, the owners, the trainer, and the jockey were convinced that they had an extraordinary horse on their hands. In January 2004, now racing as a three-year old, Smarty Jones was given his first major test against a quality field of horses in the Count Fleet Stakes at Aqueduct Racetrack in New York. In the home stretch, the colt pulled away from the field to win by 5 lengths. Realising that the Kentucky Derby was a real possibility, trainer John Servis chose to bring the horse along carefully and not push him before he was ready. In February, they shipped Smarty Jones to Oaklawn Park racetrack in Hot Springs, Arkansas, where he won the Southwest Stakes, the Rebel Stakes and the important Arkansas Derby. Despite being unbeaten in six races, Smarty Jones was nevertheless not rated as the morning-line favorite for the Kentucky Derby because racing experts believed he had not been truly tested. However, he did go off as the slight post-time favorite. On May 1, 2004, Smarty Jones became the first unbeaten Kentucky Derby winner since Seattle Slew in 1977. John Servis and Stewart Elliott became the first combination in 25 years to win the Kentucky Derby in their debut appearance. Smarty Jones won the most prestigious horse race in North America by 2 3/4 lengths, earning $854,800 for the Chapmans, along with a bonus of $5 million from Oaklawn Park for having swept the Rebel Stakes, the Arkansas Derby, and the Kentucky Derby. On May 15, after gracing the cover of Sports Illustrated, Smarty Jones won the second leg of the Triple Crown with a victory at the Preakness Stakes by a record margin of 11 1/2 lengths. The victory set off a frenzy of excitement for the sport of Thoroughbred horse racing in the Philadelphia area. After his Preakness victory, Smarty Jones' popularity increased and he became, arguably, the #1 fan favorite to aspire to win the Triple Crown since Affirmed won it in 1978. Breeders made offers for the breeding rights to Smarty Jones, with the offers going as high as 40 to 50 million dollars. However, on June 5, 2004, Smarty Jones finished a heartbreaking second in the Belmont Stakes, being upset in a late charge by the 36-1 long shot Birdstone. Speculation arose that the loss was a result of Elliott allowing Smarty Jones to assume the lead too early. However, neither John Servis nor the Chapmans ever blamed the jockey (it was held that a careful viewing of the race video revealed that Elliott had a tight hold on the reins). In addition, careful study of the race video replays provoked accusations of unethical racing by two of the jockeys, Jerry Bailey who rode Eddington and Alex Solis atop Rock Hard Ten, who "rode not to win"--that is, they specifically colluded to deny Smarty Jones the victory, rather than to win for themselves. Others pointed to Smarty Jones' relatively unfavorable 3.40 Dosage Index as being a portent of his inability to successfully negotiate the 1½-mile Belmont distance (Birdstone's Dosage Index was 1.77; the lower the Dosage number, supposedly the better suited a horse is to longer races). In any case, the 120,139 in attendance at Belmont Park that day marked the largest crowd ever to see a sporting event in New York. The Belmont was Smarty Jones' only loss out of nine starts. In many ways, his career mirrored that of Majestic Prince, who fell short of winning the 1969 Triple Crown. Both horses entered the Belmont undefeated, finished second, and never raced again. Smarty Jones was voted the 2004 Eclipse Award for Outstanding Three-Year-Old Male Horse. The end of his racing career was announced August 2, 2004 due to chronic bruising of his ankle bones. He finished his career with 8 wins and one place in nine starts, earning $2,613,155. He also earned an addition $5 million bonus from Oaklawn Park. Smarty Jones stands at stud at Three Chimneys Farm in Midway, Kentucky, and at one point occupied the same stall that housed Triple Crown winner Seattle Slew throughout his stud career until his death in 2002. Midway is also famous for once being the home of Nantura Stock Farm, where some of the first of America's great racehorses stood, among them the great Lexington and Glencoe, and where several were born, including Ten Broeck and Longfellow. Smarty Jones' first foals were born in 2006, and began racing in 2008. His best runner to date is Backtalk, winner of the 2009 GIII Bashford Manor Stakes at Churchill Downs and GII Sanford Stakes at Saratoga Racecourse.